Astrology has used the concept of classical elements from antiquity up until the present. In Western astrology and Indian astrology four elements are used: Fire, Earth, Air, and Water. In Western tropical astrology, there are always 12 astrological signs. Each of the four elements is associated with 3 signs of the Zodiac which are always located exactly 120 degrees away from each other along the ecliptic and said to be in trine with one another. Most modern astrologers use the four classical elements extensively, (also known as triplicities) and indeed it is still viewed as a critical part of interpreting the astrological chart. In traditional astrology, each triplicity has several planetary rulers, which change with conditions of sect – that is, whether the chart is a day chart or a night chart. Triplicity rulerships are an important essential dignity – one of the several factors used by traditional astrologers to weigh the strength, effectiveness, and integrity of each planet in a chart. "Participating" rulers were not used by Ptolemy, as well as some subsequent astrologers in later traditions who followed his approach. Using the seasonal qualities accounts for the differences in expression between signs of the same element. All the fire signs are by their nature hot and dry. However, the addition of the elemental qualities of the seasons results in differences between the fire signs. Leo being the midsummer sign gets a double dose of hot and dry and is the pure fire sign, but Aries being a Spring sign is wetter (hot & dry, hot & wet), and Sagittarius being an Autumnal sign is colder (hot & dry, cold & dry). In the Southern Hemisphere the seasonal cycle is reversed. This yields secondary and tertiary elements for each sign. These associations are not given any great importance in modern astrology, although they are prominent in modern Western ceremonial magic, reconstructionist neopagan systems such as neodruidism, and Wicca. 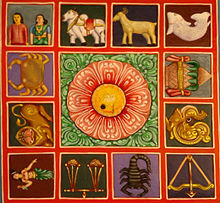 Indian astrology shares the same system as Western astrology of linking zodiac signs to elements. In addition, in Vedic thought each of the five planets are linked to an element (with ether as the fifth). It was said in the Veda that everything emanated from the one basic vibration of "Om" or "Aum." From "Om" the five elemental vibrations emerged representing the five different tattwas (or elements). The five planets represent these five vibrations – Jupiter for Ether, Saturn for Air, Mars for Fire, Mercury for Earth, and Venus for Water. In many traditional Chinese theory field, matters and its developmental movement stage can be classified into the Wu Xing. They are Wood ruler Jupiter, Green, East and Spring, Fire ruler Mars, Red, South and Summer, Earth ruler Saturn, Yellow, Center and Last Summer, Metal ruler Venus, White, West and Autumn and Water ruler Mercury, Black, North and Winter. Note that the Wu Xing are chiefly an ancient mnemonic device for systems with 5 stages, rather than the notion of different kinds of material. For further information, see Wu Xing. aPtolemy later modified the rulerships of Water triplicity, making Mars the ruler of the water triplicity for both day and night charts—and William Lilly concurred. ^ Ian Thurnwald. "Astrology on the Web: Elemental Qualities". Astrologycom.com. Retrieved 2016-11-29. ^ Claudius Ptolemy (1940). "Tetrabiblos online [tr. by Frank Egleston Robbins] in the Loeb Classical Library, 1 volume, Greek text and facing English translation". Harvard University Press. pp. 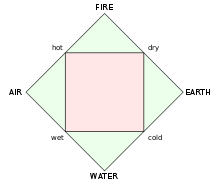 79–83. ^ William Lilly, Christian Astrology, Book 3: An Easie And Plaine Method Teaching How to Judge upon Nativities, 1647. 2nd ed., 1659. Re-published by Astrology Classics (Bel Air, Maryland), 2004; by Ascella Publications, ed. D. Houlding, London, 2000; and [in facsimile of 1647 edition] by Regulus Press, London, 1985. [orig.] P. 104.